Bengali Boys, ridden by Barry McHugh and trained by Richard Fahey, storms to an easy victory in the big race of the weekend at rain-soaked Newbury, the Weatherbys Super Sprint for 2yos. It’s hard to be upbeat within racing at present after the tragic death of stalls-handler Stephen Yarborough at Haydock Park. So it is with a heavy heart and with deepest condolences conveyed to Stephen’s family, friends and work colleagues that I trumpet the midsummer feast on the horizon, courtesy of Ascot’s King George meeting this weekend, swiftly followed by the Qatar Goodwood Festival next week. It is one of my favourite periods of the racing year. Not quite an attraction on the scale of the Cheltenham Festival or Royal Ascot, but still unmissable fare. As with the Derby, it has become fashionable in some quarters to knock the King George VI and Queen Elizabeth Stakes (sponsored by Qipco) that is the centrepiece of Saturday’s action at Ascot. Quarters usually occupied by those who seem to think it is their duty to denigrate Flat racing. But few other races in the UK ooze such rich history and prestige, and few boast such an eye-popping roll of honour. Contrast the criticism with the revelation by leading French jockey Gerald Mosse over the weekend that one of his main remaining ambitions in racing is to win a King George. That’s the kind of international appeal the great race has -- and what a renewal we could be treated to this time round if all the main protagonists stand their ground. The field at the five-day declaration stage is headed by last year’s winner HIGHLAND REEL, a hardened globetrotter fast becoming one of the giants of the game. His full brother, and fellow Royal Ascot winner, IDAHO, adds further spice to the Aidan O’Brien challenge. At the time of writing, John Gosden, who loves the race, was leaning towards unleashing his dual Oaks heroine ENABLE to fly the flag both for the 3yo generation and for the fillies. And then there is ULYSSES, brilliant winner of the Coral-Eclipse and the flagbearer of Sir Michael Stoute, whose King George record is persuasively impressive. O’Brien v Gosden v Stoute is a mouthwatering prospect in itself. But also pitching in are Godolphin, revered and revived Godolphin who could be four-handed via the quirky but talented FRONTIERSMAN, the mud-loving front-runner HAWKBILL, another Royal Ascot winner in BENBATL and another Gosden challenger in 2015 Derby runner-up JACK HOBBS. Throw in the ultra-tough PERMIAN (yet another royal hero) for Mark Johnston, tempting outsider DESERT ENCOUNTER and the race’s first-ever South American raider, SIXTIES SONG, and you have a £1.1 million contest worth travelling a long way to witness. Keep an eye on the weather and the ground at Ascot, however. It’s currently unseasonally Soft, with more rain forecast on Wednesday. Clerk of the course Chris Stickels is confident the track will dry out to Good come Saturday, but give underfoot would not be to the liking of Highland Reel. Ascot parades a strong support card on Saturday, including one of its trademark 7f cavalry-charge handicaps, a couple of intriguing 2yo races, a terrific 1m handicap for 3yos and one of the best races for lady amateur riders all year. And its line-up the previous day is a nice little aperitif too. Glorious Goodwood, as we all know it, has become one of the must-do experiences of the racing calendar. Not just because of the high-quality, richly competitive action but also because of the beautiful course’s unparalleled setting, perched high above Chichester on the rolling South Downs. Many scoff at the week’s re-branding that now embraces its sponsor, Qatar Racing, but only an ignoramus would scoff at the level of support the Qataris have pumped in over the last three years, utterly transforming the festival’s prize-money offering, which now tops £5.2 million. 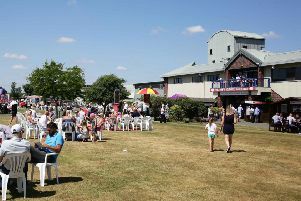 Goodwood regulars will also notice significant changes to the race programme that have been made this year, particularly to the opening day on Tuesday, August 1 that has been beefed up considerably a la Royal Ascot. No longer will the meeting limp slowly into view. It will begin with a bang and three Group races, including the 2m Goodwood Cup that has been switched from the Thursday and has had its purse bolstered by £200,000 to a whopping £500,000. BIG ORANGE, probably the most popular horse in training, bids to become the first stayer ever to win the historic race three times in succession. A repeat of the Big O’s epic duel with ORDER OF ST GEORGE at Royal Ascot is off because O’Brien’s charge has been given a breather to prepare for an autumn campaign. But we are still guaranteed at least one Duel On The Downs next week when his stablemate, dual Guineas winner CHURCHILL, tackles the best miler in Europe, Richard Fahey’s RIBCHESTER, in the £1 million Group One Sussex Stakes, which fronts Wednesday’s action. Victory for the Godolphin 4yo would further dent the reputation of the O’Brien colt after his Royal Ascot flop, and would also mean crushing defeat for the scaremongers who, shamefully, reckoned the boys in blue would not be at Goodwood at all as a snub to Qatar prompted by the crisis in the Middle East. Why would Sheikh Mohammed not want to take the Qatari millions off them? Another change to Thursday’s programme sees the meeting’s second Group One, the Nassau Stakes over 10f for fillies and mares, re-routed from the Saturday, where it often got dwarfed for limelight by the Stewards’ Cup. O’Brien holds the key, via Guineas heroine WINTER, fresh from her quickfire Group One treble, but expect a fierce challenge from Gosden, courtesy of SHUTTER SPEED and SO MI DAR. The former is much better than she showed in the French Oaks last time. Friday’s Goodwood card has often been regarded as the poor relation of the week. But it’s hard to quibble this time round with four fascinating Group races, plus one of the handicap highlights of the year, the Betfred Mile, for which the race trends suggest you back a horse drawn higher than nine at your peril! And finally the whole wonderful week is brought to a close on the Saturday when Goodwood is almost certain to put up the ‘Sold Out’ and ‘Full’ signs. Curiously, the re-arranging of the line-up has left this the weakest of the five days by far, with the least amount of prize money by far too, despite the addition of the Gordon Stakes, a solid trial for the St Leger. But it can still stand on its own two feet thanks to the standing dish that is the Stewards’ Cup, the 6f dash that punters cannot resist, plus its consolation race. Given that the weights have been released, ante-post enthusiasts will already have had a dabble. For what it’s worth, I like the look of EDWARD LEWIS but mostly, I like the look of the whole scenario that is King George weekend and Goodwood week. Regal and glorious!